American Heritage Girls all promise to “Love God.” Indeed, as Christians, AHG Members are called to love God with all their heart, mind, soul, and strength. 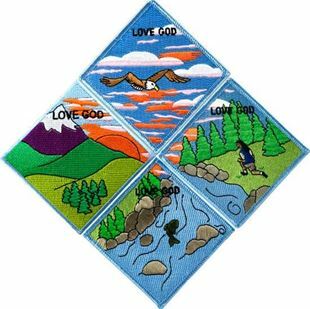 The “Love God” promotional puzzle patch speaks to this calling by encouraging American Heritage Girls to learn about, promote, and earn their Faith Awards. The Love God Promotion Patch is a four-segment puzzle patch. Only one segment will be offered in any given year. Participants are encouraged to earn all four segments over a four-year span. Patches may be pre-ordered for distribution at the presentation / information seminar. Girls can commit to earning a Faith Award at an appropriate time, making a presentation on Faith Awards to another Unit, helping younger girls earn their Faith Award, etc. Adults can commit to having 50% of families participate in the Faith Awards Program, nominating a worthy adult to be recognized with an adult religious award, serving as counselor in their local congregation, etc.